This course is for those already under way with their own forest gardens or food forests. We also advise that you should already have attended the forest gardening course run by the ART or alternatively have reasonable experience. I'm interested in a forest garden seminar course - please keep me informed about future dates. Unlike the taught forest gardening course, this course will be based very much around the participants, inviting them to talk about their own gardens and discussing their successes and failures. It should be a good way of troubleshooting problems you are having and getting good ideas for trying new things. 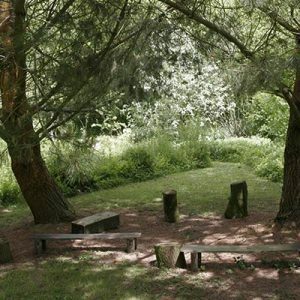 Will include several visits into the Dartington forest garden to concentrate on areas which have been highlighted by participants. Course led by Martin Crawford. Course size: up to 16 participants. The course will run 9.30-5.00 on Saturday & 9.30-4.30 on Sunday. Course fees – £180 (non-residential) includes lunches (vegetarian) + teas/coffees etc.